Created by legislature Feb. 2, 1856, and organized Aug. 4 with Oakville as county seat. Formed from San Patricio and Nueces Counties. Named for its Live Oak trees. County seat moved, 1919, to George West on railroad. Center for ranching, farming, petroleum production and processing. Recreation areas include Tips State Park and Lake Corpus Christi. Historic sites are Fort Ramirez, first settlement; Fort Merrill, built 1850 to protect early settlers; Brownsville-San Antonio Oxcart Road, used by General Santa Anna on the way to the Alamo. Other sites marked. Location. 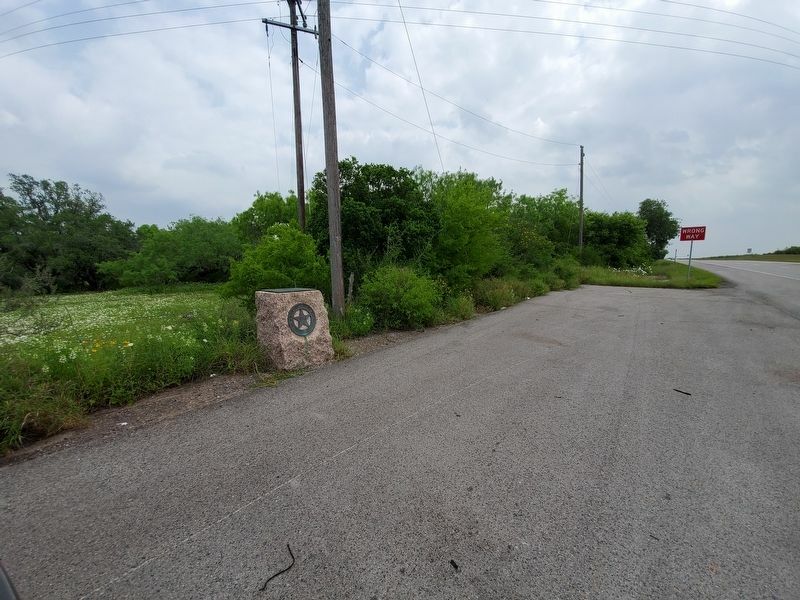 28° 18.526′ N, 98° 6.819′ W. Marker is near George West, Texas, in Live Oak County. Marker is on U.S. 281 0.2 miles south of County Road 101, on the right when traveling north. Touch for map. Marker is in this post office area: George West TX 78022, United States of America. Touch for directions. of this marker, measured as the crow flies. VFW and American Legion War Memorial (approx. 1.8 miles away); Thelma Laura Pugh-Lindholm (approx. 1.8 miles away); City of George West (approx. 1.8 miles away). More about this marker. 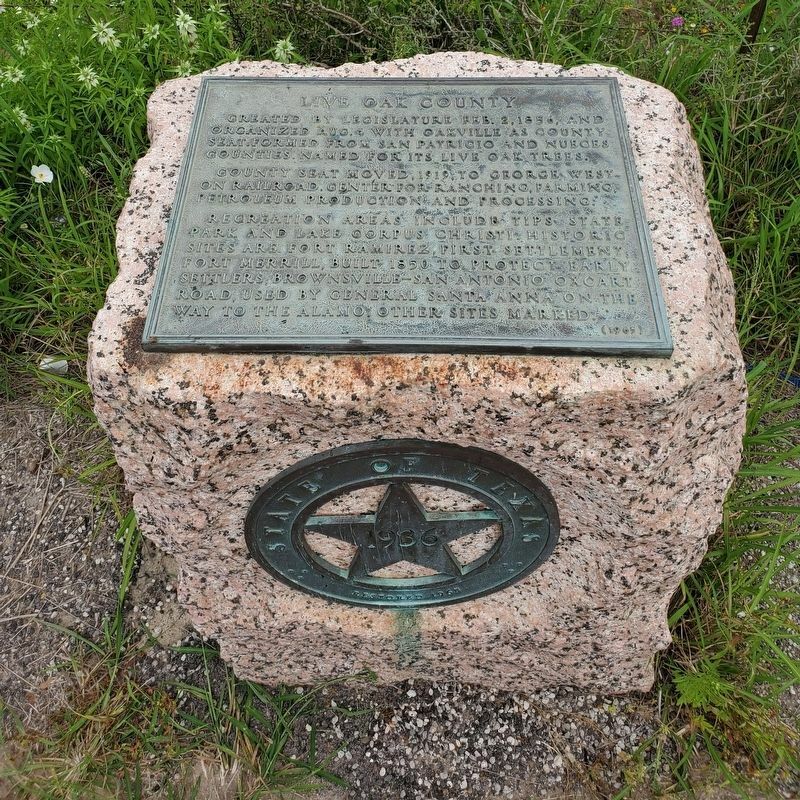 This marker was originally placed in 1936 and was restored, with new marker text, in 1965. More. Search the internet for Live Oak County. Credits. This page was last revised on April 9, 2019. This page originally submitted on April 9, 2019, by Brian Anderson of Kingwood, Texas. This page has been viewed 64 times since then. Photos: 1, 2. submitted on April 9, 2019, by Brian Anderson of Kingwood, Texas.